Simple elegance and friendly professionalism might best describe our approach to service. The crew are expert at making our guests comfortable and go out of their way to make your trip a pleasant and memorable one. The Sierra Hotel normally travels with two crew members, an Attendant and a Chef. Our crews are among the most experienced in the world of private railroad cars, some of whom have each had more than 25 years of experience on the rails. The attendant is generally the crew person in charge and coordinates with Amtrak, oversees safety, and attends to the passengers needs including food and beverage service, porter service, and maintaining the comfort and cleanliness of the car. Our Chefs are well versed in a variety of cuisines including vegetarian, gluten-free, and other dietary needs, in addition to having their own individual specialties. 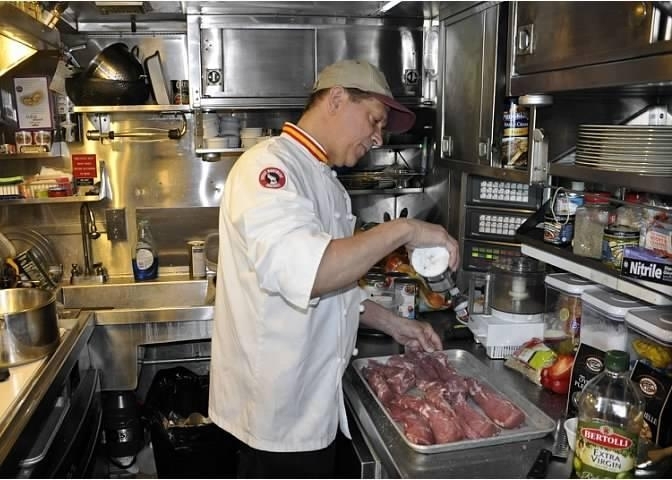 Regional and local cuisines are often emphasized in keeping with railroad tradition, and almost all food is prepared aboard with the freshest ingredients available. The Crew will work with you to customize your food and beverage selections.